The University of Leicester is claiming to have the UK's youngest ever PhD student - with a 15-year-old studying in the politics department. Eugenie de Silva's doctorate is going to focus on "denial and deception in World War Two". 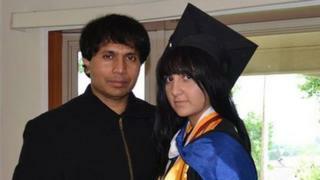 The teenager lives in Tennessee in the United States, but will study for her PhD by distance learning. Her supervisor, Prof Mark Phythian, said there was "no doubt about her ability". Prof Phythian, head of the politics and international relations department, said the young student had been interviewed by Skype and in terms of academic rigour there would be "no concessions" for her age. He added Ms de Silva was "very well adjusted and engaging". She will be expected to come to Leicester for some face-to-face sessions and exams during the course of her doctorate studies, which could last between three and six years. Jackie Dunne, dean of distance education, said that PhDs by distance learning were becoming "an increasingly popular option". Ms de Silva already has a master's degree in intelligence studies from a US university - and she has co-authored a textbook called Multidisciplinary Research for College Students. She is the daughter of an academic, Prof Eugene de Silva, who had moved to the UK from Sri Lanka and then moved to the United States, where he teaches physics and chemistry at Walters State Community College. Ms de Silva wanted to study with Prof Phythian at Leicester University because she had come across his work while studying for her previous degrees. In an interview with the University of Leicester, she said she "always had an avid interest in intelligence studies", which had inspired her interest in her PhD topic of wartime deception. Asked about being under too much pressure at a young age, she said her interest in the subject made her academic work enjoyable and that she had a "quite normal childhood". When asked about people's reactions to starting a PhD at such a young age, she said: "The common reaction that I receive is shock or disbelief."